That first bite into biscotti is sublime. These are just sweet enough, with a blend of flavors subtle enough not to interfere with your demitasse of espresso and crisp enough to stand up to dunking in hot tea. 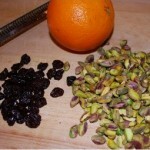 I had an idea to use pistachios, dried cherries, and orange rind. It is a great taste combination. 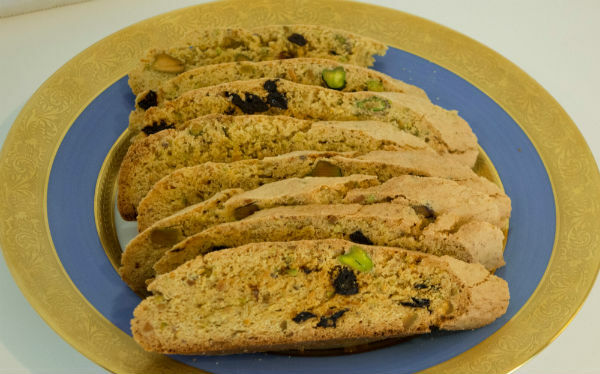 If you like pistachio and biscotti, you will love these. 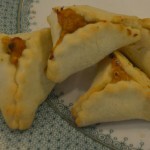 Follow this link to the old recipe, but try the new revised version. Since I first wrote those words I have made this recipe many times over. My family enjoys them and I love to put them in little bags and give away a few. Recently I attended a luncheon and took a whole tin to the hostess. She put the tin away for later and that was that, I guess there were plenty of other desserts. 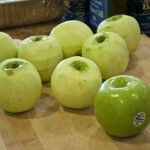 This last time I made a few changes, however subtle they improved the flavor and my son and husband noticed. It is a good idea to always have a tin of biscotti on hand. They are great for that little something after dinner, for a light dessert when you really don’t need or want a lot of calories, or when you just need something sweet, a quick fix in your mouth. Preheat oven to 350°F. Line rimmed baking sheet with silpat or parchment paper. I prefer half sheet aluminum pans. Dark colored or non stick coated baking sheets lead to different results. Combine 6 cups flour baking powder, anise, zest, and salt in a medium bowl and set aside. Crack eggs in a glass cup and after checking them for shells or blood spots, place in stand mixer (Kitchen Aid) bowl, add sugar, and beat on medium speed until light in color and thick. Add oil to eggs. Beat mixture, starting at lowest speed, until well combined. Add lemon and orange juice and mix. Add ground pistachios and mix. Next, add flour to mixer bowl. Start mixer on lowest speed. Mix until flour is incorporated. Lastly, add dried cherries and pistachios and mix until just distributed. Remove dough from mixer to wood or stone work surface. It may be slightly sticky. Add some flour (from extra cup) as you knead dough lightly with your hands until it is smooth and easy to work with. Roll dough into a smooth log and slice into 4 equal pieces. Form four logs about 2 inches in diameter and 10 inches in length. Place two logs carefully on each lined baking sheet. Place baking sheets in oven. 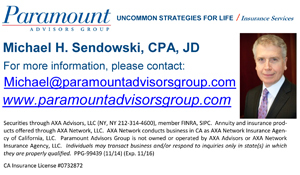 Turn once as necessary to promote even browning. Bake until golden in color 25 to28 minutes. Remove baking sheets from oven. Turn oven temperature down to 200°F. Carefully remove rolls from baking sheet onto large cutting board without breaking them. 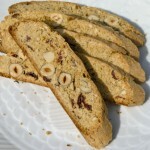 Cut immediately on a sharp diagonal with a long serrated knife making biscotti about 1/ 4 to 1/ 3 inch thick. I stop to wipe my knife off with hot water every few slices so the knife glides through. Return sliced biscotti to lined cookie sheets, being careful not to break them. Spread them so air can circulate all around them. You may use hot cookie sheet , but you will need additional baking sheets as once sliced, biscotti take up more room. Toast biscotti in a 200°F oven for two hours. After oven is turned off, leave them in closed oven overnight. They should be crisp. 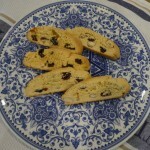 One recipe makes 60 to 80 biscotti depending on how thick you slice them. Store biscotti in an airtight tin. TIPS: I always bake biscotti after dinner, so I can slice them after baking and put a timer on the oven for two hours for toasting and then, its shuts off automatically and biscotti can just stay in closed oven all night. I purchase the highest quality shelled, organic, unsalted pistachios by the 5 pound sack full at the Santa Monica Farm Market. I store them in the freezer, airtight so I always have them on hand. I keep a dedicated biscotti knife hidden in an another drawer so it stays razor sharp.